At Acxess Spring we pride ourselves in making spring design accessible to everyone. Our team has worked for years in creating tools that make it easy for everyone to find, design and buy the spring they need. From compression to torsion, extension, and even conical springs, at Acxess Spring we have what you need and if we don't, we'll make it. Learning about our tools and how to use them will facilitate your search for the perfect spring. You may have heard of, seen, or used some of our tools such as our Spring Creator, Spring Finder and Custom Spring Instant Quote. All these tools are created for your benefit. Try them out and take advantage of all the information they provide. 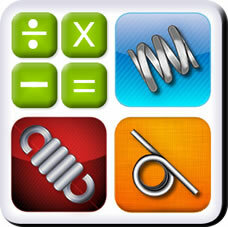 You already know that Spring Creator is our spring design calculation software. In this tool you input the required dimensions for your spring and it provides a spring analysis for you to verify. This tool not only gives you a blueprint, but the analysis which also provides detailed information on the specs and dimensions of your spring, it also has additional information built-in to help you verify loads, force, elasticity, etc. As if that isn’t enough, there is a really neat additional feature that we will discuss further in this article. Spring Finder allows you to input a few quick dimensions on the spring you are looking for and it digs into our stock catalog to display all the matches based on your inputs. This tool searches what we have in stock so you can find the closest match. Instant Spring Quote is a quick and handy tool that allows you to get a quote on the spring you need in a matter of seconds. It automatically generates prices for the spring you require based on different quantities. All you need in order to quote a spring design is the same basic measurements you are asked to enter into Spring Creator. Great news! All these are built into one simple spring design tool! You don’t need to go out of your way to use each tool individually. These three tools (Spring Creator, Spring Finder, and Custom Spring instant Quote) are built into one. When you use the Spring Creator, it is also designed to simultaneously and automatically search and use both the Spring Finder and Instant Quote tool. This way you have the results of all three in one. You will be provided with the part number of the most similar spring we have in stock to the one you designed. Then you will be given a list of the price for your custom spring based on different quantities. When you generate a blueprint, all this information will also appear in it. As if that wasn't enough we also went the extra mile to provide all our customers with the Spring Creator app so you can design and check out spring specs on the go. Download it now! Available for both iPhone and Android phones. and let us know what else we can do to facilitate your search and the use of our tools.